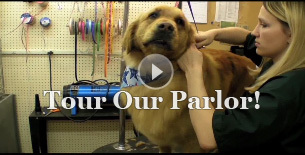 HOW WOULD YOU LIKE TO SAVE $5.00 ON YOUR DOG'S GROOMING AND SAVE A FRIEND $5.00 TOO!! Give this bone to a friend (not a Peaches' Parlor current customer) whose dog is in need of Peaches' services. When they bring their dog to Peaches' (with this coupon) for grooming, they get $5.00 OFF and Peaches' will give you $5.00 OFF on your dog's next grooming.